Santa Rosa County, Florida Panhandle Santa Rosa County, Florida Panhandle U-Pick farms: Find a pick your own farm near you in Santa Rosa County, Florida Panhandle for fruit, vegetables, pumpkins, organic foods,local produce and more! Looking for a local, pick-your-own farm in Santa Rosa County, Florida Panhandle? Scroll down this page and you will see the U-Pick farms in Santa Rosa County, Florida Panhandle, sorted by county. Those that offer organic or sustainably grown produce are identified by the words "organic" and/or "sustainable" in Green, next to their name (see "What does Organic mean?"). 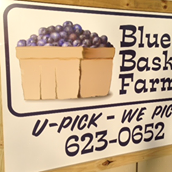 The U-pick crops they offer follow the name of the farm. To search the page for a specific crop, use Ctrl-F (or on an ipad or Mac, use their "search on this page" function) If they have a website, the name will be in blue and underlined; click on it and it will open their website. If you find anything outdated or inaccurate, see the customer and farmer menus (as appropriate) at the top menu bar to submit updates and corrections and help me keep each current! A visitor writes on January 20, 2015: "Excellent for a day of fun"
State Road 89 north of Milton, FL. Phone: 850-623-0652. Open: June through mid-July, Monday through Saturday, from 7am to 7pm Monday through Saturday; closed Sundays and Fourth of July.